Time travel. Fear. Confusion. Could I be describing the premise of a contemporary novel flying off bookshelves faster than Amazon sales rankings can keep up with? Perhaps. Or, these could be a few words to describe the sixth out of the 93 Persephone Books reprinted thus far, (an independent publisher in England that reprints neglected classics by mostly 20th century women). 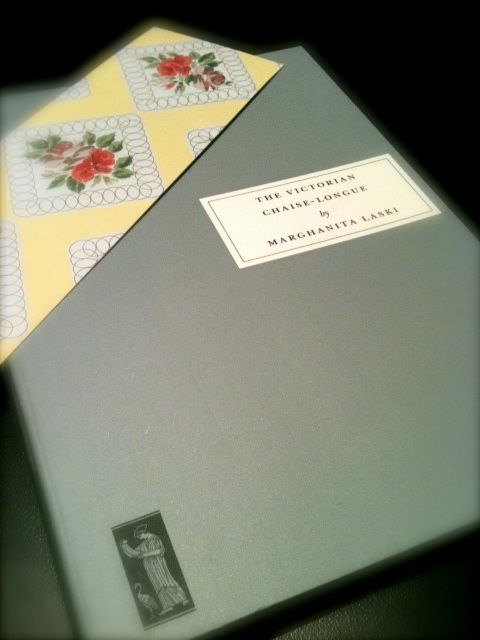 The Victorian Chaise-Longue, by Marghanita Laski, was first published in 1953 and at only 99 pages, this tiny book is creepier and more uncomfortable than many Gothic books published today. I sat transfixed in the short time it took to read it. Eerie. Creepy. Uncomfortable. The young wife, Melanie, suffers from tuberculosis and is confined to her room, hoping that she will survive with her doctor's help and can return to a normal life with her family, most especially with the baby she has yet to hold. When her family decides that she should move from one room to another in the house, the Victorian chair that Melanie purchased the very day she was diagnosed with tuberculosis is situated in the room. While resting upon the ugly chair, Melanie wakes up in a world almost 100 years before. Also ill with tuberculosis in this earlier time, Melanie is now surrounded not by a caring husband, but by a sister who holds a secret with her, and the clean room that she fell asleep in has now become a dirty, smelly, and unkempt room. Nothing is the same, save for the Victorian Chaise-Longue and Melanie's mind. Then a sound, a door opening (but it took a long time to translate the noise into comprehension), and a woman said, "Well, Milly? Are you ready to wake up now?" Descriptive and engaging, Marghanita Laski's story is one that showcases this author as a brilliant strategist, one who crafts a powerfully Gothic punch with each unsettling moment, and in the shortest amount of time. Melanie's new body is much weaker, and the sordid decor and pungent smells of the Victorian time are no dream. It is real, it is happening to her, and she cannot gather her strength to get out of this tangled mess. She is trapped in a body not her own, imprisoned within the shell of a weak and sick woman, and she is without the family that she believes she has left behind. Without question, it is a classic of monumental significance, and one that has led me to become a new fan of Persephone Books. FTC Disclosure: My husband got me two Persephone books for Christmas and I meant to read them right away. I didn't and now that I've finished this one, I'm kicking myself that I waited this long. I'm currently reading the second one he gave me, Marghanita Laski's Little Boy Lost. Marghanita Laski was born in 1915 to a family of Jewish intellectuals in London; Harold Laski, the socialist thinker, was her uncle. After working in fashion, she read English at Oxford, married John Howard, a publisher, and worked in journalism. 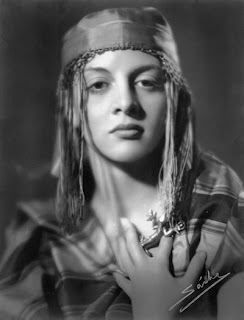 She began writing once her son and daughter were born: among her six novels were Little Boy Lost (1949), The Village (1952) and The Victorian Chaise-Longue (1953). A well-known critic, she wrote books on Jane Austen and George Eliot. Ecstasy (1962) explored intense experiences and Everyday Ecstasy (1974) their social effects. Her distinctive voice was often heard on the radio on The Brains Trust and The Critics; and she submitted a large number of illustrative quotations to the Oxford English Dictionary. Her home was in Hampstead, where she died in 1988. This picture is from The Guardian website, which listed The Victorian Chaise-Longue as one of the 10 Best Neglected Literary Classics. Oh! Now I want to read this story. I keep meaning to check out Persephone books. Thanks for the reminder to do so. Great review too! uuuUuuu Sounds creepy indeed. I think it'll be ideal for this year's RIP Challenge. This does sound excellent! I have long wanted to own one of my own Persephone books, and I have it narrowed down to Few Eggs, No Oranges, but it sounds like I might need to order this one as well. It does sound ridiculously creepy, and I am really interested in finding out just what happens to the main character in this one. Is her tuberculosis cured, and does she ever get back home? enticing questions that are probably going to lead me to place an order very soon! Thanks for the great review, Natalie! This sounds amazing! Love short spooky stories (The Yellow Wallpaper anyone?). The appearance of the author really surprised me too. She looks like a hippie chick from 2011! That sounds creepy, what an unusual idea for a story. I haven't read any Persephone books yet, I really should. All of these books sound so cool! This one sounds like a nice, quick read. i love how i totally missed the whole persephone thing. i walk around with my head in the clouds, i guess! i love laski's premise--sounds like a great read. I am definitely adding this one to my list after reading your review! This sounds like a real page turner! Hope you find some great blogs through it and also get some new readers. There's a button on my blog for you to use. I really need to read something by Laski. Beautiful endpapers! This sounds fantastic! Unfortunately my library does not seem to have it, but they do have Lost Little Boy, which I've added to my to-read list. I've been meaning to read this. I read my first Laski a few months back (To Bed With Grand Music) and thought it was fantastic. Will probably read Little Boy Lost next, so looking forward to your thoughts on it. I've heard it's very very good, which isn't surprising at any level.